Dunbar and Boardman: What was different about the HKSB building designed by Lord Foster? 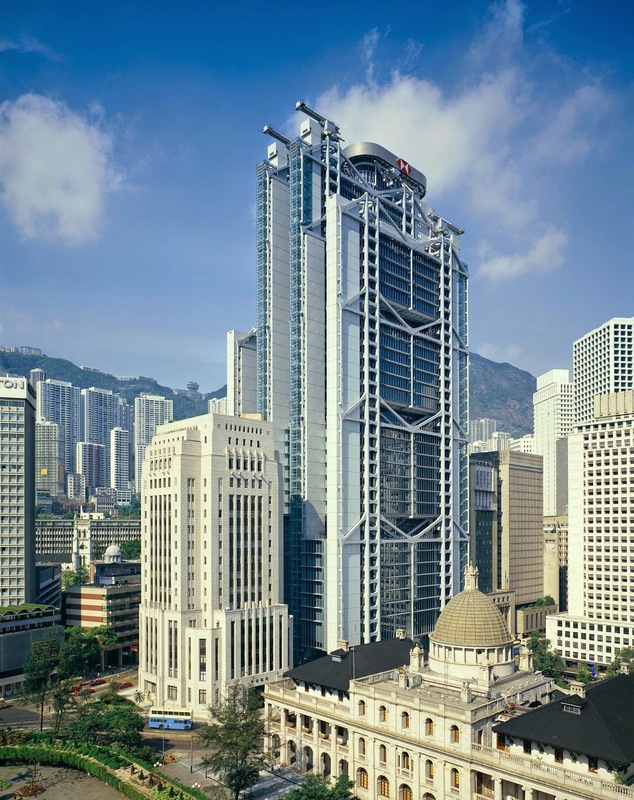 The Hong Kong & Shanghai Banking Corporation building (HK) was completed in 1986, designed by the renowned architect, Lord Norman Foster of Foster and Partners based in Britain. It is the fourth HSBC building on the same site in Statue Square, Hong Kong. In many ways the Willis Faber and Dumas Headquarters in Ipswich completed in 1974 represented a dry run for Foster and the Hong Kong & Shanghai Banking Corporation building cemented Foster’s reputation for high tech architectural design. There are many unusual aspects to the design and construction of this 47 floor skyscraper building, from following Feng Shui principles, the use of sunlight as the principle source of light, the use of seawater rather than fresh water in the air conditioning, the modular steel sections fabricated in the UK and shipped all the way to Hong Kong, and the use of escalators rather than elevators as the principle method of moving people around the building - the elevators only stop every few floors. Specifically the vertical transportation concept was to have elevators serving every eight floors skipping the intermediate floors with escalators linking the intermediate floors. In fact, the deliberate use of escalators and elevators in this building gives a fascinating insight into the principles behind the design. Firstly, the building has been planned as five distinct structural zones, stacked vertically. As well as being assembled as separate sections, these zones are functionally separate, housing subsets of the Bank’s operations. The twenty-three high speed elevators, located on the West of the building, deliver staff and members of the public to the double height truss, or structural transfer, levels. These double height levels incorporate reception areas, fire refuge terraces, dining and recreation areas as well as conference rooms for each bank area. The decision was made that within each structural zone, clients and staff would circulate by escalators moving up and down between the floors. There are a total of sixty of these escalators in the building, planned to allow a more sociable method of moving around within the "social village" of each part of the Bank. Another interesting design aspect is the visibility of the elevators and escalators. 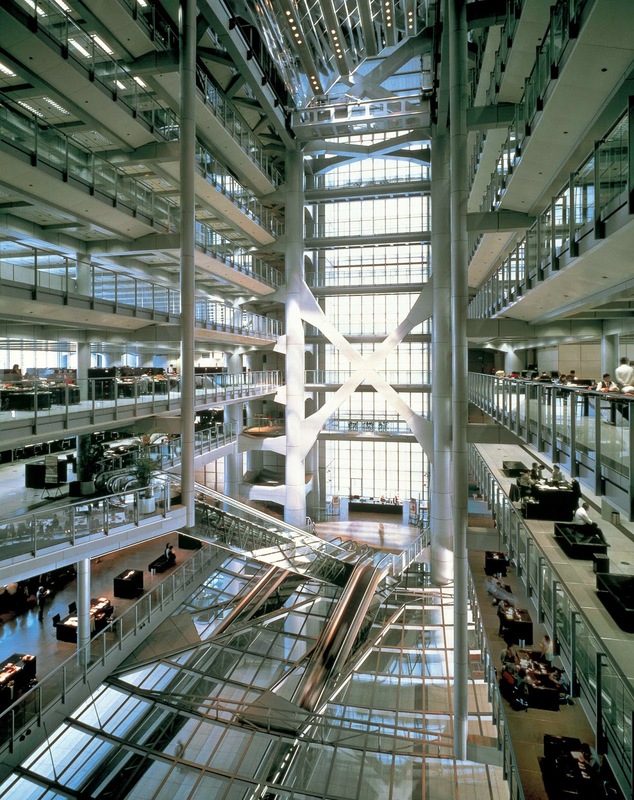 We are now familiar with glass elevator shafts, but Norman Foster, who also designed the Hearst Tower in New York City and the Millennium Bridge in London, went one step further in his design for this building. Not only are the elevator shafts glass, so that you can see the movement of the elevators through the building, but even the floor has been removed from the elevator core, so that you can stand beneath and view the lifts rising and dropping through the building. In addition, the undercarriage of each escalator is glass, revealing the intricacies of the machinery within to those working beneath. It was said that the elevators represented Chinese lanterns when illuminated at night. On the ground floor a large public plaza sits almost empty. Eight steel masts are visible, carrying the entire weight and wind-load of the superstructure down through the four basement levels to the bedrock. The only other interruption in the expanse of the plaza is the presence of two angled escalators leading up into the curved ceiling and to the banking floor above. These escalators, and this expanse of plaza are all located and positioned according to the underlying principles of Feng Shui, a discipline that is clearly evident throughout the design of this building, even including the importance of an uninterrupted view to Hong Kong Harbour and concrete canons to deflect bad energy from other buildings. Dunbar and Boardman conducted a peer review of the HKSB building with Pell Frischmann in 1983.